All week we have been sharing decoupage ideas that all take 15 minutes or less. I thought I would round up all of those ideas for you here today. If you are looking for unique decoupage ideas, this is definitely the post for you. We have posts from various bloggers so a wide variety of crafts that are perfect for any time of the year. So, grab your bottle of Mod Podge and get ready! You will soon be decoupaging all the things! I am going to list all of the craft ideas below and you can click on each one of those to open up the instructions in another window on your computer. If you want to see pictures of the crafts before you open them, you will want to scroll to the bottom of the posts from day 1, day 2, day 3, day 4, and day 5. Otherwise, just find the decoupage ideas you love below and pin or bookmark them for later. So, which of these decoupage ideas will you try first? Decoupage crafts are usually fairly easy to do and do not take a ton of time. These crafts all take just 15 minutes or less so there are no more excuses! You do have time to get creative. 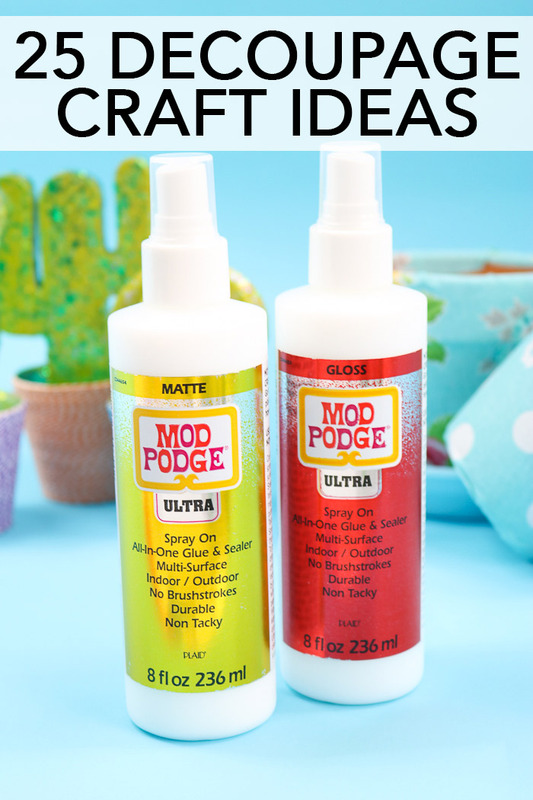 Just grab a bottle of Mod Podge and get started on any of these unique decoupage ideas.